RECHARGING THE ART. 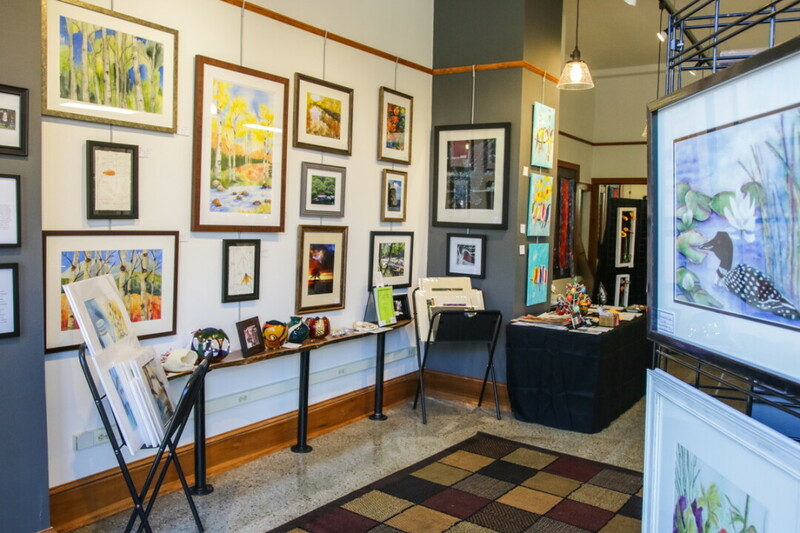 The Valley Art Gallery had remodeled its space at 304 Bridge St. in Chippewa Falls. The current exhibit features 13 artists offering wall art, fiber crafts, pottery, and more. The Valley Art Gallery at 304 Bridge St. in Chippewa Falls will host a grand re-opening event Saturday, Nov. 3 from 10am-5pm to show off a newly renovated gallery space. The Valley Art Association co-op features the work of 13 artists, from gourd carvers to glassworkers. Wall art, fiber crafts, and pottery are available for viewing – and for purchase – at this downtown location. The Valley Art Gallery opened for the first time in 2016 in the early 1900s building that once housed the Hotel Northern. At this point, the interior was done up in 1950s style, with lowered ceilings and other updates that have since fallen out of fashion. After a year and a half of business, Steve Rasmus, the building owner, decided it was time to restore some of the original architectural beauty of the space. “We have tried to do a renovation that respects the architectural integrity of the original,” Rasmus said. Although the project was not technically a restoration, it was done using original blueprints. Rasmus raised the ceilings to their original height and used original materials where possible in the renovation. He also worked with the co-op to fit the space to its needs with details such as a picture rail and a display ledge next to the floor-to-ceiling windows. “It was really such a family when we started,” original co-op member Kris Crowe said. “It was a beautiful experience because every woman in there was pitching in.” The members did their best to maintain that sense of kinship throughout the time the gallery was closed. During the year-long renovation period, the 13 co-op members put their heads down and produced as much art as they could. They often checked in with one another, maintaining the community even though they weren’t actively managing the gallery. “We’ve got a really good karma between us,” said Barb Lowe, who makes carved and painted gourds. The artists consider the co-op a great way to bond with and support one another in their endeavors. “The art becomes kind of a hub and a glue to connect you to other people,” said Mary Gladitsch, a mixed-media artist and original member. The gallery also aims to support the community through providing locally made art and fun classes taught by Valley Art Association members. The group is excited to see guests from out of town come through the shop to experience local artistic culture as well. “We think the gallery is just a wonderful addition to Chippewa’s downtown and keeping with the artistic vibe happening in the Chippewa Valley as a whole,” Crowe said. The Valley Art Gallery will be open Tuesday-Saturday through November, and Monday-Saturday after Thanksgiving. For more information about the store, find it on Facebook or call (715) 226-1921.